Billings (May 5, 1820 - June 14, 1896) was a Canadian geologist and paleontologist, who was the first Canadian paleontologist. 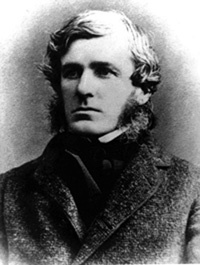 He published his first scientific paper on Trenton fossils in 1854. He launched a new monthly periodical, The Canadian Naturalist and Geologist in 1856, which he also edited and was the major contributor. In Aug 1856 he was appointed staff paleontologist with the Canadian Geological Survey by William Edmond Logan, the founder of the Survey. Billings immediately began the task of identifying a 20-year backlog of fossils collected by the Survey. By 1863 he had published descriptions of no fewer than 526 new species of fossils. The Billings medal, named in his honour, is awarded annually by the Paleontology Division of the Geological Association of Canada as a means of recognizing the most outstanding of its paleontologists. On April 27, 1869, the Director of the GSC, Sir William Logan wrote this curt note to the paleontologist Elkanah Billings: "Your constant absence from the office is a worrying annoyance, particularly as I have reason to suspect that it does not arrive from rheumatism". For more info on Billings click HERE. Click HERE for more information on the Geological Association of Canada.